Just a quick update on how I've been getting on with my diet/training/motivation over the last few weeks. I know I've been relatively quiet lately but that’s more to do with being too busy to post stuff than not sticking to the plan. A lot has happened so it's probably too much to catch up on in one post, so I won't bore you with all the details. My main achievement and what this blog is all about is that I have lost 4lbs over the last few weeks, which I am pleased about and I feel like things are getting back on track. I am training well in most areas, although struggling with strength work as my motivation to get to the gym is at an all-time low, as I have now given notice to leave, so now going there makes me angry and I can't focus on my workouts properly, so I have been doing some body weight stuff at home, plenty of lunges, squats and press ups to try and keep on top of it, but I know it's not enough, so I am addressing this. I am also going to the Exceed Fitness bootcamp once a week so I can get some sort of structured training, I'm no longer able to afford any PT sessions and realistically one a month isn't enough. Other parts of my training are going well, for example my swimming is coming along really well. Last week I went swimming with @TheIron_Bear who hasn't seen me swim since he helped me get over that fear of putting my head in the water months ago. To be honest I was having a bad swim, this was not being helped by my goggles steaming up so he suggested we swapped to see how I got on, it made a massive difference, I could actually see and didn't feel that I needed to bring my head so far out of the water which in turn gave me more speed, @TheIron_Bear told me afterwards that I was quick, and that he would have had to work hard to lose me, the only trouble is I can't keep it up for long enough to be of any challenge.......yet! This has put me in good stead for my upcoming triathlon as if I can keep that speed up I will be out of the water in an amazing time. Also, I am hoping that it won't be long before I can make 500m which then means I can try out some open water swimming before the end of the season. I have also been trying another tactic for speeding up when running. 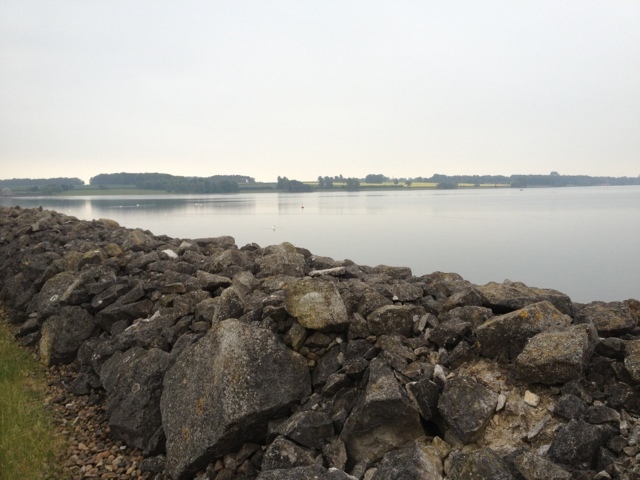 I went up to Rutland Water last week with @TheIron_Bear so he could do some open water swimming so took the opportunity to go for a 15 minute out and back from Whitwell toward Normanton along the Dambuster Triathlon route, this also gave me a chance to have a look at the open water set up so it wouldn't be so daunting when I actually pluck up the courage to go myself! So off I went on my out and back, I tried out a run/walk strategy, 2mins run 30secs walk remembering the running technique stuff that I had been through with Mary a few weeks ago. It was a success, I ran further with this run/walk strategy than I had on a flat out and back the week before where I had run all the way. Don't get me wrong, it was hard work as when I was running I ran at an 8:30min/mile pace, which is very quick for me!! But, I was pleased with the distance that I covered in 29:17, 2.92miles.